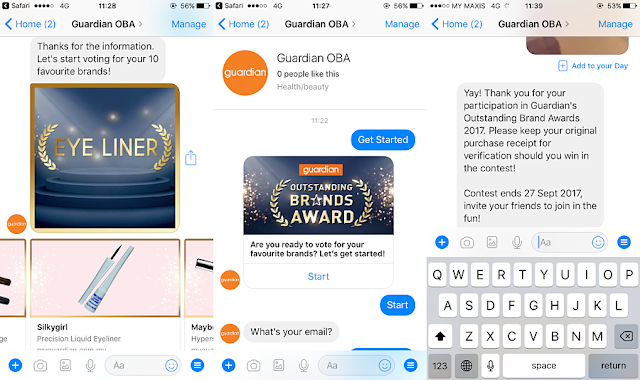 JQ Talks: There's A New System That Allows You To Vote Stuff Through FB Messenger?! There's A New System That Allows You To Vote Stuff Through FB Messenger?! Technology is really something these days. It seems like we can really do it all with the help of super-coders and techie people in this world. Seriously, I salute you guys/girls. Thanks for constantly trying to make our lives more convenient. I was at the launch of Guardian's Outstanding Brands Award (OBA) 2017 and although I love how short and sweet the event was, I wished they would serve us free warm/cold water. I'd probably sound like a brat now but this was what happened. I requested for warm water from the server and he said they have to charge as it wasn't in the package ordered by the event people. =_= Thank you very much Nicsmann in The Starling. That aside, when Guardian finally asked up to start participating in their annual Guardian's Outstanding Brands Award online, I thought it would probably just be another "go to our website" and land yourself into a 'ServeyMonkey' looking kind of layout. After keying in the website provided by Guardian (http://m.me/GuardianOBA), it jumped straight from my safari app into my FB Messenger app on my mobile. From then on, it was just me following instructions - clicking Start button, stating my details, and vote for whatever I preferred available on screen. It was pretty simple and cool at the same time. Mainly because this concept is so new and foreign to me. As much as yes, there was a technical difficulty during the event in the midst of voting due to the amount of people voting at the same time. The bot decided to "crash/hang/stuck/not responding" by not replying me. Generally by now, in normal surveys, I'd probably get really upset as if I reload the site, I had to freaking start all over again, keying in my details and vote from the beginning. BUT NOOOOOO, with this system. I don't have to restart anything. I can just leave and continue later and pick up where I left earlier. GENIUS! So I did. During the event, I decided to get my food and had a little catch up session with my blogger friends. Once I'm done, I went back into my FB Messenger App and text or select the same answer according to the last questions (doesn't matter how many times to key in the same answer) and they replied with the next question. YAS LA! Being intrigued by this voting system (I'm probably going off the topic of the actually highlight of Guardian's annual Brands Award), I went on google and found out that they are known as Chatbot Surveys On Facebook Messenger and the website that I found does this calls the Surveybot. I'm sure there are other brands/website that does this and I'm also sure Guardian used something that can handle a higher frequency of surveyors. But hey, if you are interested, the basic one is free to create and extract results. Now back to Guardian's OBA 2017, this year, there's a total of 200 brands vying for 60 categories ranging from hair care, face care, cosmetics, hygiene, supplements, medication, mother and child products, and more. If you don't know, there will be one most preferred brand award for each category. To be eligible to cast their votes, you are required to spend at least RM10 at the store or online. Then log on to http://m/mq/GuardianOBA or scan the QR code provided to vote. Voting needs to be done anytime between 1 Sept 2017 to 27 Sept 2017. Contest opens to those aged 18 and above and keep the original receipt as proof of purchase (containing tax invoice number, store code number, date of purchase and purchase amount). For more information, visit www.guardian.com.my. ALL THE BEST Ya'll!